History is full of improbable people, and I have always been fascinated by highly improbable people. Werner Goldberg was one of those improbably person. During World War 2, Werner Goldberg was one of the best known people in Nazi Germany. 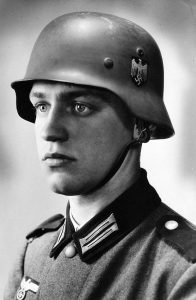 Photos of Werner Goldberg in his German army uniform appeared on billboards and army recruiting posters all over Germany. He was known to the German public simply as ‘the ideal German soldier.’ Almost nobody in Germany knew his real name or that he was a Jew. In 1933, Werner Goldberg’s father was fired from his job when Hitler came to power because he was a Jew. Werner was unable to get a job for the same reason. Werner needed to make money to feed his family, so in 1938 he joined the army. Werner saw military action soon after completing basic training. He participated in the German invasion of Poland in 1939. Shortly after the invasion of Poland began, a German army photographer took photos of Werner Goldberg and sent them to the Berliner Tagesblatt, a major newspaper in Germany’s capital. They liked the photos and published a full-page picture of Werner Goldberg in their Sunday edition. The newspaper didn’t state his name. They probably didn’t know it. They captioned the photo ‘The Ideal German Soldier.’ Hitler was very impressed by the picture and ordered it reprinted on Nazi propaganda and army recruiting posters. Eventually Nazi officials discovered the truth, that the ‘ideal German soldier’ was a Jew. Goldberg was forced out of the army, but he was never sent to jail or a concentration camp. In 1942, Werner Goldberg rescued his sick father who was being held in a Gestapo prison hospital for Jews. On Christmas Eve, Werner went to the hospital. He gambled that the guards and Gestapo agents at the door would either be absent from their posts or drunk because of the holiday, and he was right. Werner got into the hospital by showing the guards a photo of himself captioned ‘the ideal German soldier.’ The guards recognized the photo and let Werner into the hospital. Once inside, Werner simply went to his father’s room, dressed his father in street clothes that he brought with him and simply walked out the door with his father. Werner Goldberg survived the war and died in 2004. Why Do German Directors Wear Monocles? Back in the 1930s and 1940s, Hollywood’s Golden Age, many of the top directors in the U.S. were Germans. Most of them moved to Hollywood when Hitler came to power; however, some important German directors in Hollywood arrived long before the Nazi era. Erich von Stroheim was a big movie star in the U.S. during World War 1. He was the first German actor in Hollywood to figure out that the way to get jobs directing big-budget movies was to act the role of a stereotypical German theatrical director. He knew that Americans had a very clear idea what German directors were like. Americans thought that German directors were arrogant monocled tyrants, terrorizing the people who worked under them, but that they were also artistic geniuses. 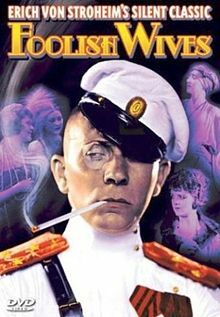 Von Stroheim knew how to play to that stereotype. He starred in many big-budget movies in World War 1 and World War 2, always playing a nasty, arrogant, monocled German military officer. American audiences lapped it up! Von Stroheim was billed as ‘the man you love to hate.’ Von Stroheim began wearing a monocle soon after arriving in Hollywood, but he didn’t actually need glasses to see. The lens in von Stroheim’s monocle was just window glass. He wore the monocle as part of his theatrical personae. Twenty years after von Stroheim arrived in Hollywood, Hitler came to power, and a slew of top German directors moved to Hollywood, most of them Jewish, and all of them looking for work. Two of the best of these Jewish German directors were Otto Preminger and Fritz Lang. Both of them knew Erich von Stroheim. Soon after arriving in Hollywood, both Preminger and Lang started wearing monocles. Neither of them wore monocles when they lived in Germany. They also began sneering when being photographed. Like von Stroheim, they quickly got jobs directing important movies. My favorite movie directed by Otto Preminger was ‘Laura.’ It has often been called the best cinema noir movie ever made. Preminger won the Academy Award in 1944 as Best Director for that film. He also acted in a number of movies. In ‘Stalag 17’, Preminger played the arrogant, sadistic commandant of a German POW camp. In that movie, Preminger plays with his monocle while tormenting American POWs. So, if you know someone with a German accent who wants to become a big-name Hollywood director, my advice is – start sneering and get a monocle!